Bustling towers soaring above 520 Park Avenue and 220 Central Park South are catching the interest of buyers and are becoming occupied, according to The New York Times. The newly opened towers at 520 Park Avenue and 220 Central Park South, each designed with stately limestone facades by, are steadily filling up, according to The New York Times. The sales at the property were of note too, with the most expensive city sale of the year happening inside the building. Property records show that a duplex penthouse sold for $73.8 million. The other big sales at the building were another penthouse duplex that sold for $62 million, as well as apartments on the 30th floor selling at $25.86 million, the 24th floor at $23 million, and the 23rd floor at $20.01 million. The 54-story condominium, at Park Avenue and East 60th Street, began its closings in September; many more units are under contract. 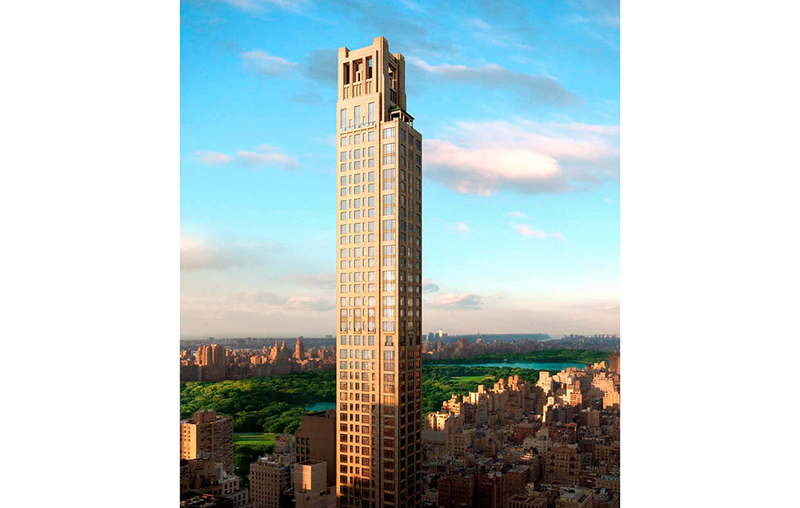 Right around the corner was a sale for much less but still quite a lot, coming in at $13.49 million for the privilege of living at 220 Central Park South. A 23,000 square-foot penthouse is expected to sell for around $250 million at that location if anyone is willing to buy it, which is currently the most expensive listing in New York. Several other notable transactions took place in the month of November. Keith Richards of Rolling Stones fame is moving out of his duplex penthouse in Greenwich Village. Guitarist Paul Waaktaar-Savoy, from the 80s band A-ha, sold his spot in SoHo, with both rock stars selling their downtown properties for $9 million each. The Jewish Voice has reported on the New York real estate scene being the hottest it has pretty much ever been at the top. New York rents have been notorious, though declining prices in some neighborhoods caught the attention of economists and hopeful renters alike. For the elite real estate clientele, times haven’t been better, with records being broken left and right. The Real Deal highlighted some of the most notable happenings in the real estate market. Development outside of Manhattan has outpaced the borough, and Queens, now looking to cash in on Amazon, is a prime spot to build and sell luxury properties. The biggest sale belongs to a fund managed by Carlyle Group, who will pay $284 million for 1 QPS Tower. Long Island City may be getting big, but even this deal is noteworthy as it would be the biggest real estate deal in the neighborhood’s history. The Jewish Voice reported on the purchase when it happened and described the tall building’s amenities, like an outdoor swimming pool, a gym, and even some events like outdoor yoga and learning how to garden in a city.